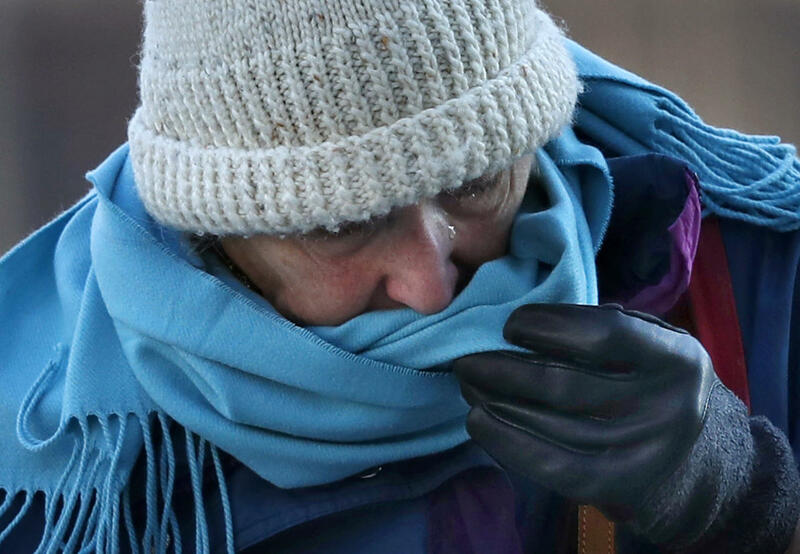 CONCORD, N.H. -- Plunging temperatures and gusty winds made their way Thursday into the Northeastern U.S., the next victim in the path of dangerously cold temperatures to hit the country. A strong Arctic cold front moved across the region with temperatures falling throughout the day and commuters, schools and outdoor workers slowing down, girding up, and taking precautions. Vermont public safety officials warned residents to limit their time outdoors at least through Friday with dangerous wind chills of minus-35 in the forecast. Some schools and government offices closed early in upstate New York ahead of lake-effect snow expected to bring 1 to 2 feet. Blowing snow in Syracuse, New York, slowed the morning commute on Interstate 81 to a crawl. Parts of the Adirondack Northway, north of Albany, were closed for more than four hours after a crash involving a tractor-trailer and a snowplow. No injuries were reported. Elsewhere in upstate New York, along the Lake Ontario shore, wind gusts approached 70 mph and the National Weather Service issued a blizzard warning effective through early Friday morning. Lake-effect snow was accompanied by winds up to 50 mph causing whiteout conditions in some places. The arctic blast brought the coldest temperatures since February in New York City, CBS New York reported. “I don’t like it,” Mount Vernon resident Chris Neumann told CBS New York. Grace Papaseraphim and her daughter, of Astoria, Queens, said running from store to store for a few more gifts was the only solution for braving the elements. It wasn’t just the cold, the wind was to blame as well. “Well, it keeps you walking, you know?” one man said. The strong gusts sent trash flying and decorations dancing. “I feel like it’s going to blow me away,” 15-year-old Sidney Rivera said. “When I was at 125th Street station, it blew me away, so I went back downstairs,” Marise Louis, of Old Mill Basin in Brooklyn, said. In parts of Vermont, New Hampshire and Maine overnight, the frigid weather and wind will cause temperatures to dip below zero as winds gust up to 30 mph and chills near minus-20. Forecasters said a storm will follow the frigid temperatures, bringing chances for snow, sleet and freezing rain across much of the U.S. While it sounded pretty grim, some winter weather veterans took it all in stride. Jon Asmund, a state bridge construction superintendent in New Hampshire, swears by fleece-lined pants. “They do wonders,” he said. Some 90 miles north, Will Irvine was hoping to finish up inspection work on a covered bridge in Conway and avoid the low temperatures and strong wind coming Friday. Some of his crew members were suspended underneath the structure for several hours. “You manipulate your work schedule for whatever Mother Nature’s going to give you, because you’re not going to change her,” he said. As the arctic air tracked northeast, Connecticut Gov. Dannel P. Malloy planned to activate the state’s severe cold-weather protocol Thursday night, calling for state police and other agencies to work with shelters and community groups to protect vulnerable residents. Malloy also encouraged communities to open warming centers. Wind chill advisories enveloped much of the Midwest and Northeast on Thursday. And the winter weather conditions claimed at least two lives earlier in the week. A snow and ice-covered road was a factor in a crash Wednesday night that killed a 22-year-old man in a car that lost control and spun into a snowplow in Springport, New York. A 34-year-old woman died of hypothermia in St. Paul, Minnesota. She was found Monday, when temperatures dropped to 3 below zero and wind chills were minus 19. Maine State Police said a malfunctioning kerosene heater played a role in the death of a man in Turner. The man was found dead Thursday morning in a camper trailer, heated by two kerosene heaters. There was thick smoke and soot in the camper.